When it comes to passing exams at school, the curriculum unfortunately is such that it often comes down to little more than a memory test. While your child might have a fantastic understanding of history, of German or of physics, they can lose crucial points if they fail to remember their dates, their nouns or their elements. This may seem unfair in some ways, but the fact is that in some cases it can be difficult to test a child’s understanding and competency without memory coming into it – and memory is after all an important skill to cultivate in the real world. The good news though is that if you want your child to pass with flying colours there are ways that you can improve their memory skills and help them to learn. Here we will look at some ways you can do that whatever your child’s age or level of education. A mnemonic is a memory technique that relies on a rhyme or association to make something stick in your mind more. For instance then this could be an acronym or it could simply be a little memory ‘trick’ such as counting your knuckles to know the number of days in a given month. These can be useful for children of any age, and once you teach them to create their own mnemonics they can find what works best for their own mental processes. If your children are anything like I was as a child, then they’ll do backflips when the teacher says they’re going to watch a video for an hour instead of having a regular lesson. The fact is that children are used to focussing their attention on TVs, and the use of music and graphics makes them far more memorable and engaging. There are plenty of lectures and documentaries on YouTube that can make a subject much more fascinating even when a child is fed up with it, so suggest they seek these out and you can help them to retain the information better. 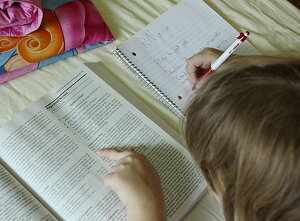 If it’s not so much a matter of helping your children to revise and learn as it is a matter of getting them to do it, then you may find yourself trying to make the subject more interesting and exciting while competing with distractions like computer games. Why not make the process more fun then by turning learning into a game? This could be something simple like ‘Hangman’ wherein the words you choose are all relevant to the subject they need to learn, or you can get more creative and make a board game out of it. Visualisation techniques are recommended by memory gurus and others, and are used in conjunction with basic repetition to remember great lists of objects. This can be used even to ‘encode’ numbers, for instance ‘one, six’ can become ‘gun, sticks’ for which you might imagine a gun made out of sticks. By imagining two objects next to each other in the same scene for instance, it’s possible to remember a sequence. The more bizarre the images are that have to be remembered, the better your child will be able to remember them. A memory palace takes the above technique one step further. Here the child will attempt to fill an imaginary room or building with different items and should then be to retrieve that information by walking around the imaginary space and looking at those items on display. It’s an advanced technique, but very powerful when used well. Mood boards are used by designers to make plans for their works of art and involve creating collages of ideas and concepts. They can be used as a memory aid too though by using lots of relevant images and information in big fonts. Creating these is fun, and looking at them will help your child to see the information in their mind’s eye. Mind maps are similar, but instead involve drawing a ‘network’ of ideas using lines and bubbles to simulate the way we make connections in our minds. If you want to help your child then you can do so by leaving messages on post-its and written in washable marker around the house. This way they can wake up and fall asleep to the facts and figures they need to remember and it will eventually get imprinted onto their brains by osmosis alone. Ruth Jennings is a teacher, coach, wife, and a proud mother of two adorable kids. She likes blogging in her spare time. She says if your kids grades have dropped considerably then hiring a private tutoring service is a great idea. Top Memory/Learning Techniques For Helping Children To Study was posted in Learning by Guest Author.